Breakfast is the most important meal of the day and, for many, it isn’t complete without coffee. Eight O’Clock Coffee brings more than 150 years of expertise to the breakfast table, turning this morning meal into an experience to savor - complete with perfect coffee pairings. 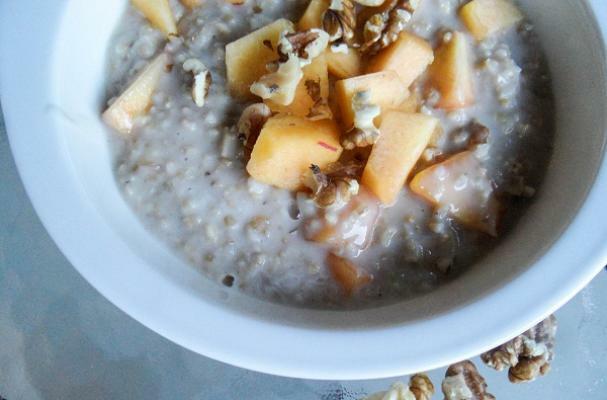 Oatmeal is a classic way to start the day – simple, filling and hearty. Topped with some fresh fruit and almonds or walnuts and honey, its flavor goes from bland to grand. This mild-flavored breakfast food goes well with a lightly roasted coffee like Eight O’Clock Coffee’s French Vanilla or Hazelnut. Eight O’Clock Coffee Roaster Brewing Tip: Mix half a serving of Ground Hazelnut and Ground French Vanilla to deliver a Sweet and Nutty flavor. 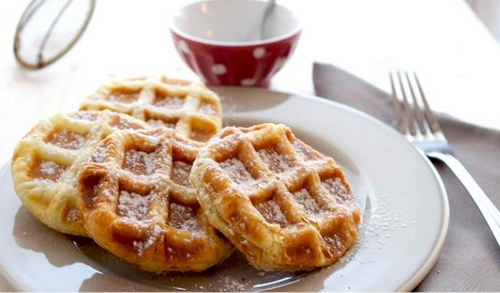 Sweet breakfasts cooked on the griddle, like pancakes, waffles and French toast, are usually topped with syrups, jams or whipped cream. To offset all that sweetness, go with the bold flavor of an espresso or dark-roasted coffee. Eight O’Clock’s Dark Italian Roast hits the mark and is perfect for espresso aficionados. Eight O’Clock Coffee Roaster Brewing Tip: Add a dollop of Whipped Cream in place of Milk or Cream and savor the European experience. The traditional American-style breakfast of Eggs, Bacon, Sausage, or a hearty Ham steak is a match for Eight O’Clock Coffee’s Original Roast. Whether you like your eggs fried, scrambled or sunny side up, this medium roast coffee is an ideal choice to balance the savory flavor of egg dishes. Eight O’Clock Coffee Roaster Brewing Tip: Set aside a ½ cup of coffee to create a toast-mopping red eye gravy to garnish the Ham Steak. See the full recipe here. Quick grab-and-go breakfasts, including breads, muffins and bagels, pair well with all Eight O’Clock Coffee varieties. Try a variety that appeals to your taste today! From meals on the run to a lovely weekend breakfast in bed, Eight O’Clock Coffee offers a wide range of gourmet coffee varieties to complement a morning mealscape. 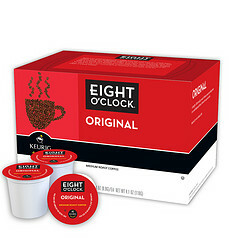 America’s Original Gourmet Coffee is available in Ground, Whole Bean and Keurig® K-Cup packs, so whether you prefer the experience of brewing a whole pot or the convenience of using single-serve K-Cup® packs, there is an Eight O’Clock Coffee for you. 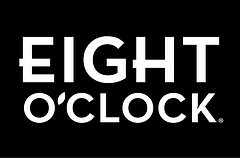 To get the latest from Eight O’Clock, be sure to Like their Facebook page here. Great article, Sheri! Hopefully this will bring new people "into the fold" who haven't yet tried this coffee. Eight O'Clock Coffee has been my preferred brand for 45+ years, one of the very few brands of coffee that doesn't upset my stomach. My home has never been without it. Of all the varieties, Original is my favorite. They also make a limited edition Chocolate Mint, which is out of this world! Mixing the flavored varieties is a great idea. Try mixing half Hazelnut and half Mocha...it's delicious! Thanks Ronda! I love their hazelnut (I use the K-Cups), but I must try the Chocolate Mint! YUM! Happy Sunday!